Three other American citizens are being detained in North Korea, at a time when Kim Jong Un has been firing missiles and threatening to strike the United States. 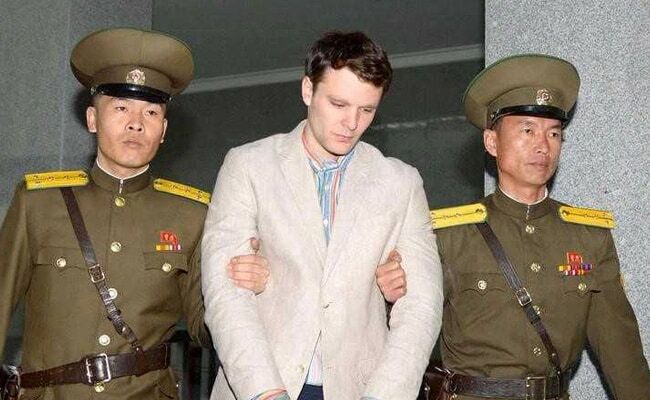 Otto Warmbier was arrested by North Korea in January, 2016, and sentenced to 15-years hard labour. A plane carrying University of Virginia student Otto Warmbier, who had been detained in North Korea for 17 months and was in a coma for most of it, touched down in Cincinnati on Tuesday night. The 22-year-old's return marks an end to the ordeal that his family has been through, not knowing what had happened to Warmbier since he was sentenced to 15 years in prison with hard labor in March last year. But the fact that he had been kept, comatose, in North Korea for more than a year could worsen the already tense relationship between Pyongyang and Washington. Friends and well-wishers gathered outside Cincinnati's Lunken Airport Terminal ahead of the anticipated 10 p.m. arrival of the plane carrying Warmbier. Two mobile intensive care units arrived at the private terminal where his family was awaiting his arrival, and drove onto the tarmac when the plane landed. Two women waiting outside the airport fence held signs: "WELCOME HOME OTTO" and "PRAYERS FOR OTTO," and said they were there to support his family. Charlotte and David Simons, who said they have been friends of the family for more than 30 years, came to watch his flight come in, too. "We're just here to support Cindy and Fred and the family," Charlotte Simons said. She was feeling "sick to my stomach for them," she said, thinking of how their son should have been graduating from college this spring. David Simons was marveling that another country could treat an American like this. "I can only feel for what the family is going through," he said, shaking his head. After a senior State Department official flew to Pyongyang to demand Warmbier's release on humanitarian grounds, he was flown out in a medical evacuation. "We get to see our son Otto tonight," Fred Warmbier said in an interview Tuesday morning after his son was evacuated. "We'll be relieved to have him home and are looking forward to surrounding him with people who love him." Warmbier's parents hadn't heard from or seen him since he was sentenced to 15 years in prison with hard labor in March of last year for attempting to steal a propaganda poster at the end of a five-day tour of North Korea. But amid the relief, there were also new questions about what happened to him: How did a healthy young man fall into such a deep coma? The North Korean government told his parents that food poisoning was to blame. And how does the Trump administration respond? Three other American citizens are being detained in North Korea, at a time when Kim Jong Un has been firing missiles and threatening to strike the United States. President Donald Trump has been vowing to exert "maximum pressure" on North Korea to make it abandon its nuclear weapons program but has also dangled the prospect of talks with Kim, whom he called a "smart cookie." Warmbier was flown out of North Korea on the same day that Dennis Rodman, the controversial former basketball star, arrived for his fifth visit to Pyongyang. Officials involved in securing Warmbier's release told The Washington Post that it had nothing to do with Rodman's trip to Pyongyang, calling it a "bizarre coincidence" that might have been a deliberate ploy from North Korea to distract from Warmbier's condition. "Dennis Rodman had nothing to do with the release of Mr. Warmbier," said Heather Nauert, a State Department spokeswoman, adding that the government was "thankful" that he would soon be home in his parents' arms. She also reiterated the State Department's travel advice against going to North Korea, with which the United States has no diplomatic relations. "Let me reiterate this: We strongly, strongly suggest that Americans do not go to North Korea," Nauert said. At the time of his arrest, Warmbier had been on an organized New Year's tour in North Korea, a five-day stopover on his way to Hong Kong for a study-abroad trip. But on his final night in Pyongyang - New Year's Eve - he apparently went to a staff-only floor of his hotel and attempted to take down a large propaganda sign lauding the regime. He was charged with "hostile acts against the state." Surrounded by North Korean guards, Warmbier delivered a highly scripted "confession" that appeared to have been written for him, and after an hour-long sham trial in March 2016, he was sentenced to 15 years in prison with hard labor. He had not been seen in public since, and Swedish diplomats, representing U.S. interests, had been denied consular access to him. Officials involved in negotiations to free Warmbier and another American citizen being detained were told they were being treated as prisoners of war. During a secret meeting in Oslo last month with Joseph Yun, the State Department's special representative for North Korea, high-level North Korean officials agreed that Swedish diplomats in Pyongyang would be allowed to visit the four Americans imprisoned by the North. But in Pyongyang, the Swedes were allowed to see only one detainee, and it wasn't Warmbier. As the Americans continued to push for the Swedish diplomats to see all four, North Korea's ambassador to the United Nations urgently requested a meeting with Yun in New York, according to Trump administration officials, who spoke on the condition of anonymity about the still-secret arrangements. There, North Korean officials told Yun about Warmbier's condition. He informed Secretary of State Rex Tillerson, who consulted with the president, the officials said. Yun was instructed to prepare to travel to Pyongyang with the intention of bringing Warmbier back to the United States. A medical team and aircraft were organized, and North Korea was informed that a delegation would travel there. "It wasn't a situation where they asked," one official said of the U.S. representatives. The North Koreans "were informed that the airplane would land, American and medical officials would get out." Yun was under orders, which the official said came directly from Trump, to demand to see Warmbier immediately, and, "if he was in bad shape," to demand his immediate release and evacuation on the plane's return flight to the United States. Yun arrived in Pyongyang early Monday with two American physicians. They were immediately taken to Warmbier. Yun insisted on Warmbier's immediate release on humanitarian grounds, officials said, and the North Koreans agreed. Tillerson called Trump at 8:35 a.m. Tuesday to inform him that Warmbier was on an airplane en route to the United States, an official said. The last instruction the president left Tillerson was: "Take care of Otto," the official said. The Warmbier family said they were informed that North Korean officials had told American envoys that their son became ill with botulism soon after his show trial. The North Korean account, the family said, claimed that Warmbier then fell into a coma after being given a sleeping pill. The Warmbiers said they were told their son has remained in a coma since then. There was no immediate confirmation from U.S. officials of North Korea's description of his illness - including whether he was stricken with botulism, a potentially fatal disease that is caused by a toxin but is not usually associated with loss of consciousness. U.S. officials in touch with Yun and medical personnel declined to say whether Warmbier remains in a coma or to make any comment on his current medical condition. North Korean representatives at the United Nations did not respond to repeated requests for comment. North Korea has woefully inadequate medical care, and it is not clear how North Korean doctors had been caring for Warmbier for more than a year in an unconscious state. Warmbier was to have graduated last month had he not been detained. "While the entire University of Virginia community is relieved to learn of Otto's release from North Korea, we are deeply concerned and saddened to learn from his family that he is in a coma," U-Va. President Teresa Sullivan said in a statement Tuesday. Annabella Vagonis, a family friend from Reston, Virginia, whose daughter was close with Warmbier at U-Va., said, "We were at turns incredulous, shocked, surprised, joyful and sad, all kind of emotions within a nanosecond of each other when we got the news this morning. "We are so incredibly joyful that he is finally coming home. We are concerned about his overall health and not knowing the details of his being in a coma. We're hopeful that with the excellent medical care that he'll receive that we'll receive some good news once they examine him. " Sen. Rob Portman, R-Ohio, called Warmbier's arrest and trial "unnecessary and appalling," while lawmakers from Virginia also denounced North Korea's actions. The three other Americans detained by North Korea remain there. A former Virginia resident and naturalized American citizen, Kim Dong-chul, was arrested shortly after Warmbier on accusations of espionage and was sentenced to 10 years with hard labor. In April and May, North Korea detained two other Korean Americans, both of them affiliated with the Pyongyang University of Science and Technology, a private institution run by Korean American Christians. Previous detainees have been released after visits from high-profile Americans, including former presidents Jimmy Carter and Bill Clinton. But efforts to persuade North Korea to release the men now held had not been successful until Warmbier's release Tuesday. The Washington Post's Karen DeYoung, David Nakamura and Jenna Portnoy in Washington contributed to this report.